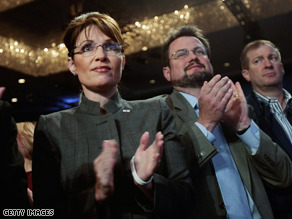 Palin was in New York City Thursday. (CNN) – Prominent conservative columnist Kathleen Parker, an early supporter of Republican VP candidate Sarah Palin, said Friday recent interviews have shown the Alaska governor is "out of her league" and should leave the GOP presidential ticket for the good of the party. The criticism in Parker's Friday column is the latest in a recent string of negative assessments toward the McCain-Palin candidacy from prominent conservatives. It was fun while it lasted," Parker writes. "Palin’s recent interviews with Charles Gibson, Sean Hannity, and now Katie Couric have all revealed an attractive, earnest, confident candidate. Who is clearly out of her league." Palin's interview with Couric drew criticism when the Alaska governor was unable to provide an example of when John McCain had pushed for more regulation of Wall Street during his Senate career. Palin also took heat for defending her foreign policy credentials by suggesting Russian leaders enter Alaska airspace when they come to America. Palin was also criticized last week for appearing not to know what the Bush Doctrine is during an interview with Charlie Gibson. “If BS were currency, Palin could bail out Wall Street herself," Parker also writes. "If Palin were a man, we’d all be guffawing, just as we do every time Joe Biden tickles the back of his throat with his toes. But because she’s a woman — and the first ever on a Republican presidential ticket — we are reluctant to say what is painfully true." Parker, who praised McCain's "keen judgment" for picking Palin earlier this month and wrote the Alaska governor is a "perfect storm of God, Mom and apple pie," now says Palin should step down from the ticket. “Only Palin can save McCain, her party, and the country she loves," Parker writes. She can bow out for personal reasons, perhaps because she wants to spend more time with her newborn. No one would criticize a mother who puts her family first. Do it for your country." Parker's comments follow those by prominent conservatives David Brooks, George Will, and David Frum who have all publicly questioned Palin's readiness to be vice president. "Sarah Palin has many virtues," Brooks wrote in a recent column. "If you wanted someone to destroy a corrupt establishment, she'd be your woman. But the constructive act of governance is another matter. She has not been engaged in national issues, does not have a repertoire of historic patterns and, like President Bush, she seems to compensate for her lack of experience with brashness and excessive decisiveness." Wrong. Plainly wrong. What you so obviously fail to understand is that no one here has set up "some static amount of experience that someone has to have before they become Vice President or President of the United States." The only thing we have said is that it is plainly obvious to most, and now even to some within McCain's own campaign ranks, that Sarah Palin is not qualified to be VP or Pres, based almost solely on her clear unpreparedness and lack of knowledge on the issues most important to the US and its citizens today. Simply because she is obviously unprepared does not mean that there is a static level of experience that must be met in order to be prepared. If she came in with her present level of experience but also showed herself to be a quick learner possessing a keen intellect, an ability to display a fundamentally sound understanding of the issues and the ability to field questions and speak comfortably, intelligently and logically about those issues, I doubt anyone would be saying she's unqualified. But she hasn't displayed anything even close to that. How anyone can honestly and objectively look at her interviews and think she's ready to be the VP is beyond me. Even her own handlers are admitting she's not. Quite honestly, I believe anyone who looks at her interviews and thinks they're anything besides embarassing is so overwhelmingly partisan they can't even face up to reality anymore. Look at her statements on foreign policy. Do you honestly believe that's the kind of understanding we should have from our second in command? Look at her statements on the economic crisis. Is that the kind of understanding we should have from our second in command? Look at her statements on culture (people who travel abroad are from some culture that isn't used to working all their lives). Is that kind of understanding we want from our second in command? Do you want a VP who is treated by her own administration as someone who should be shielded from questions for fear of her appearing out of her depth? Is that the kind of strength of character, intellect and strong leadership you want at the top? Face it, she's an embarassment, and for John McCain to have decided she was the best person for the job is an insult to all Americans, and quite frankly, unfair to her. She's clearly unprepared. Diemen can buy me dinner anytime. Not to be picky, but I think you overstate the duties of the VP. Their only constitutional duty is to break ties in the Senate. Powers beyond that are at the discretion of the president. Second in command in foreign policy would be the Sec. of State. The Sec. of Defense or Chairman of the Joint Chiefs of Staff would be his top advisors for the military. Let's watch the live debate and see. but the whole point of a VP is that they be prepared to be president in a heartbeat. it doesn't matter what their official duties are so long as the president is serving. those are secondary to their primary purpose -- to take over should the president become unable to perform his role. agreed. it should be a very, very interesting night. but the whole point of a VP is that they be prepared to be president in a heartbeat. Ideally, yes. But a clear line of secession is the raison d'être. Now should the unthinkable happen, why doesn't the presumably Democratic Congress just impeach Palin 1 hour after she's sworn in so we can put the irrefutably-qualified-to-be-president Nancy Pelosi in the oval office. Then we can have San Francisco values from sea to shining sea. Well because being stupid isn't an impeachable offence. And the Democratic Congress apparently believes in upholding the Constitution. I realize that might be a bit of a foreign concept to a Bush voter, though. do you want to have a real discussion or not? and don't make him cry either..
".......don't make Him cry either....."
What's wrong with San Francisco values? it's a conservative code word for permissive values that make it seem like it's okay for our young people to go gay and not have families and children and live in the suburbs and drive SUVs and eat hamburgers. like how every derision of New York as an undercurrent of anti-semitism. and uppity means blacks who aren't properly deferential.